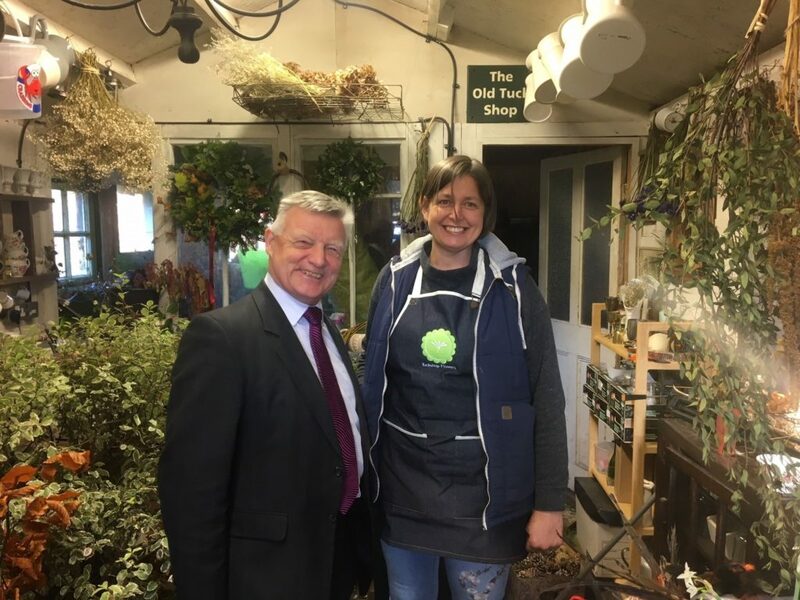 Last week Steve McCabe, our local MP dropped into the Tuckshop as the national ‘Small Business Saturday’ initiative prompted him to find out what was going on in the world of small- and micro-businesses in his Selly Oak constituency. I was expecting a whistle-stop visit, but we actually ended up having quite a long chat about the changing nature of small business and the high street, the benefits of community networks within the small business world and the evolution of my business in general. Whilst I understand why the government is keen to encourage businesses that are going to scale-up and expand to provide employment and increased tax revenue, I’m determinedly not looking to mimic this model for my own business. Being able to manage my own workflow, being my own boss and not having to fill in endless forms is how I work best – even when employed by others. I am getting steadily busier, and it’s hard at times to keep all the plates I’m spinning as a one-woman-band in the air, but the thing that keeps me going is that I love my job with a passion. At the start of my flower-growing career, finding Flowers from the Farm, a network of small-scale flower growers working to raise the market share of British grown seasonal cut flowers from the shocking level of around 10% of the UK cut flower market, was the key to me finding the motivation and community to keep me doing what I do. My own personal drive to get locally grown, seasonal British flowers more widely used comes as much from an aesthetic view point as an ecological one – they just look and smell so different to the uniform blooms which international wholesale markets demand. My passion was lit by people’s responses to funeral flowers I created, and one of my proudest achievements in business is my growing reputation for natural arrangements for this most personal of occasions – I’m part of the vanguard of small artisan florists who are able to offer a lovely alternative to people seeking something at the opposite end of the spectrum from the ‘things in catalogues’ approach to funeral flowers. Entwined in all of this is the community of people I’m involved with – all those other small businesses I work with who share ideas, enthusiasm, practical support, advice, time and all the travails of self-employment. Some of these of course, are flower growers and florists, and others are undertakers, apronmakers, stunning local community venues (Stirchley Baths, St Nicolas Place), caterers and other local suppliers. Even though our businesses are diverse, our growing pains, issues and insights are often freely shared and discussed. I may work on my own day-to-day but it’s been a while since I felt this connected to the people I work alongside. 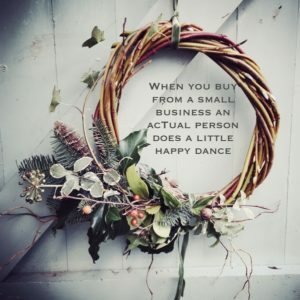 A popular instagram meme around Small Business Saturday was the ‘Happy dance’, and although it’s a little corny, it’s also true. So excuse me while I go and jig in my workshop to catch up with my wreath orders. My deliveries start next week, and if you’d like to order a lovely round thing for your door, drop me an email before 18th December when the great workshop tidy up will begin and the wreath elves will be put back into hibernation until next year.